The idea behind top-roping is that there is already an anchor attached at the top of the route. One end of the rope is attached to the belayer, drawn up through the top anchor, and the other end is attached to the climber. Top-rope is a great way to get used to climbing vertical walls, without having to fall very far when you fall off a hold. How far you fall depends on how much slack is in the rope at the time. Along with bouldering, top-rope is the type of climbing that beginners commonly start with, especially in a climbing gym. What equipment do I need for top-rope? To try top-rope climbing at an indoor gym, all you’ll need are a harness and some climbing shoes. Most climbing gyms will have this equipment available for rent. You may also want a small chalk bag that you can attach to the back of your harness in case your hands get sweaty far from the ground. You’ll also need a route to climb with an anchor attached at the top. Most climbing gyms will have the anchor and rope permanently attached, as well as a belay device attached to the belayer’s end. This is great for beginners because you will probably not need your own rope right away if you’re going to be top-roping in gyms. For most top-rope climbing setups, you’ll need to bring a partner to belay you. Top-roping together is a great way to have fun with your friend or significant other on a night out or a date. What do I need to know to climb top-rope? The best way to learn everything you need to get started safely is to take a top-rope introduction course at your local climbing gym. They’ll teach you what you need to know about getting ready to climb safely and how to communicate with your belayer as a climber. How to tie the figure 8 knot, and how to loop it through your harness properly and create the double figure 8. How to communicate with your belayer when you’re climbing. You’ll learn when and how to ask for more slack in the rope, or for them to take the slack out of the rope. How to let go of the wall and lean back when you’re finished so you can be lowered safely and comfortably. What do I need to know to belay for top-rope? 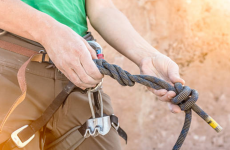 How to pull the rope slack through the belay device, without ever letting go of the rope, and being ready to brake at any time. When the climber starts to climb, the belayer pulls the slack out of the rope. To be a good belayer, you’ll need to learn how to pull out the extra slack, yet leave enough slack in the rope for your climber to make their next move. Someone can show you the proper techniques to use, but it won’t start to become natural until you’ve practiced. Never to let your brake hand go. Even though you’ll most likely be using an auto-locking device when you’re new, it’s still good practice to keep the rope under control. How to “take”, why, and when. When your climber wants to take a rest, or if they know they are about to fall, or at the top of the climb, you’ll need to get all the existing slack out of the rope. The physical motions of this will become automatic the more you practice. How to lower the climber. It might take a bit of getting used to operating the belay device to lower the climber. Climbing with different partners with differences in weight will change the amount of pressure you need to use too. How to watch and communicate with your climber while you’re belaying. Always be watching and listening. Establish an understanding of the words you’ll use for more slack and to take the slack out, and practice reacting until it becomes natural. It can be hard to hear especially the higher up the climber gets. Before you even step your first foot onto the wall, there are some good habits to get into such as double-checking your harness and knot, and also your partner’s. Before every climb, check that your partner is properly fastened to their harness. Check yourself, then check your belayer. It’s a good idea to get into the habit of doing this, so that you’ll do it automatically each time you are getting ready to climb. 99% of times everything will be secured correctly, but it’s that rare time that something is missed that you want to catch. And these things DO happen. It’s always a good idea to check that everyone is secured correctly. Once you’re satisfied that everything looks correct, you can trust your equipment and simply climb to the best of your ability. 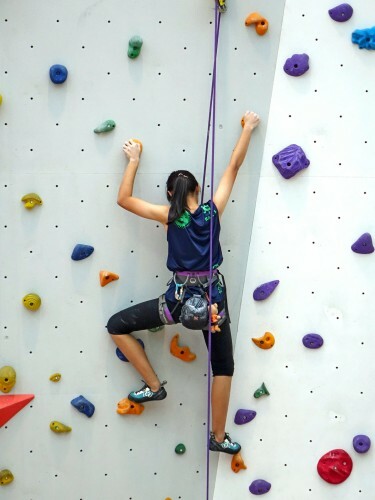 As a beginner at a climbing gym, usually the top-rope anchor, rope, and belay-device are set up properly for you and are permanently attached to the route. This makes top-rope is easy to get into, and will give you some exposure to the sport. Eventually you’ll start coming across more of the equipment and setup that you need to set this up for yourself, and for more advanced climbs and outdoor climbing. It will all start to make more sense to you as you become less of a beginner. Some gyms have auto-belay devices set up for top-rope routes. These are devices that you clip in to and the rope is automatically pulled up for you as your climb. If you fall, or when you want to be lowered from the top of the route, it lets you fall down slowly and you land on the ground. Whey are especially great for doing “laps” and some of them even have a counter up top to count how high you have climbed if you keep doing the route over and over. Auto-belays may take a bit of getting used to, especially if you get used to having a real person belaying you. With a person belaying you, you can do things like take rests, or keep trying a move over and over if you fall. An auto-belay device will simply lower you to the ground every time you fall off. 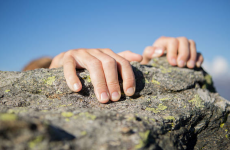 If you don’t already have somebody else interested in climbing with you, that can be a big challenge for people who want to get in to rock-climbing. If you are starting to climb and have no partner, there’s a good chance that other people at your local climbing gym are in the same position and feeling the same way. One of the best things about learning to rock climb is all the new adventurous people you’re going to meet, so go there and boulder until you meet people that want to start top-rope wall climbing with you!